Download: Public Square grant announcement remarks from Ronn Richard, President & CEO. CLEVELAND – The Cleveland Foundation board of directors today announced the latest in a series of centennial legacy grants commemorating 100 years of impact in Greater Cleveland. At a community event in Public Square, the foundation committed $8 million in a grant to LAND Studio, Inc. for the Group Plan Commission to transform Public Square. 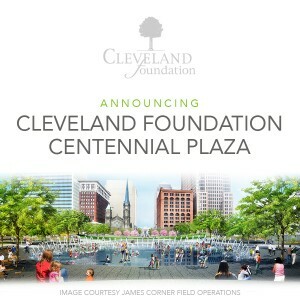 The Group Plan, working with nationally recognized landscape architect James Corner Field Operations, has developed plans for a dramatic $30 million transformation of Public Square that will make it a world-class public space in the heart of Cleveland. Planning officials for the Public Square revitalization project also announced that the south plaza of the redesigned space will be named “Cleveland Foundation Centennial Plaza” in recognition of the foundation’s commitment to creating a vibrant cultural and economic center for Cleveland and the region. The foundation’s history of place-making support is evident throughout Cuyahoga, Lake and Geauga counties. For example, in just the last four decades, the Cleveland Foundation has granted nearly $6.9 million to LAND Studio and related organizations to increase access to high- quality public spaces, parks, and programming in and around Cleveland. Additionally, the Public Square Preservation and Maintenance Fund of the Cleveland Foundation, created in 1988, has granted more than $1.3 million to the Downtown Cleveland Alliance for the upkeep and maintenance of Public Square. Public Square planning officials expect the grant from the foundation to be catalytic in securing the additional funds necessary to complete the transformation by May 2016. The Cleveland Foundation’s centennial legacy grant series commenced in September 2012 with the announcement of $10 million to support Case Western Reserve University’s new medical education and research building. In 2013, the foundation announced plans to commit $10 million in grants to create a local Encore program in Cleveland, part of a national movement to utilize the time and talents of Americans aged 50-plus for the betterment of their communities. In addition to these extraordinary legacy grants, the foundation has celebrated its centennial through monthly gifts to the community. To date, the foundation has partnered with 11 nonprofit organizations for the centennial gifts, which highlight community assets the foundation has played a role in establishing or enhancing through the years. LAND studio (Landscape, Art, Neighborhoods, Development) was formed in 2011 through the merger of Cleveland Public Art and ParkWorks, two of Cleveland’s leading non-profit organizations focused on enhancing public spaces. LAND studio’s mission is to create places and connect people through public art, sustainable building and design, collaborative planning, and dynamic programming. To learn more about LAND studio, visit www.land-studio.org. The Group Plan Commission was assembled in 2013 to update and build upon Cleveland’s Group Plan of 1903, the iconic vision that helped shape the heart of downtown Cleveland more than a century ago. The Group Plan is focused on three priority projects to transform and connect the city’s signature public spaces: redesigning and revitalizing Public Square, enhancing the downtown malls, and creating an iconic pedestrian connection between downtown and the lakefront. Working with partners like the Greater Cleveland Partnership, the Downtown Cleveland Alliance, and LAND studio, the Group Plan will combine public, private and philanthropic resources to complete these projects, complement the $3 billion in development in Cleveland’s downtown core since 2010, spur an additional wave of transformational development, and renew the heart of Downtown Cleveland for today’s Clevelanders and future generations. For more information, visit www.groupplan.org.